See this in 3D tomorrow! Earlier this month we invited you to share your thoughts on Europe's 3DS eShop content, particularly the disparity between North American video content and that available across Europe. As always you did not disappoint and your voices were heard, as from tomorrow you'll be able to watch 3D game footage on the eShop. 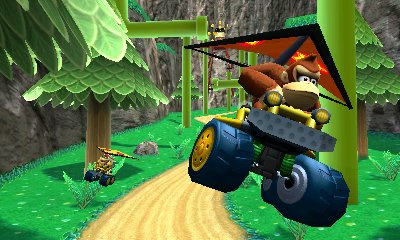 30th June 2011 – Following the recent reveal of upcoming games for Nintendo 3DS at E3 Expo 2011 in Los Angeles, Nintendo is giving you the chance to download ten free game trailers showcasing some of the landmark games which were showcased at E3 2011, and which are arriving soon for the Nintendo 3DS™. Trailers for upcoming titles such as Mario Kart™, Star Fox 64™ 3D and Super Mario™ (temp), to name but a few, will be available to download from the Nintendo eShop from 1st July for a limited time only. Arriving in two packages, each containing five trailers, this content will be available via the new Nintendo eShop made available by a recent system update to your Nintendo 3DS system. The first set of trailers contains Mario Kart, Resident Evil®: Revelations, Star Fox 64 3D, Super Mario and The Legend of Zelda™: Ocarina of Time 3D and will be available from 1st July – 20th July. Keep an eye out for the second batch of 3D trailers from E3 2011 which include Animal Crossing™, Kid Icarus™:Uprising, Luigi’s Mansion™2, Metal Gear Solid 3D Snake Eater and Paper Mario™ which will become available to download from Nintendo eShop next week for a limited period of time only. The Nintendo eShop, gives Nintendo 3DS owners access to a vast array of new 2D and 3D exclusive content, including free downloads such as the Pokédex™ 3D, original 3D software, 3D Classics, Game Boy™ and Game Boy™ Color “Virtual Console™” games and an extensive library of Nintendo DSiWare™ games. New content is added every Thursday so make sure you check back regularly. If you haven’t performed the recommended system update yet and want to download the E3 trailers, simply start the “System Settings” from the Home Menu, select “Other Settings” and scroll the page right to select “System Update.” Once updated enter the newly downloaded Nintendo eShop and download the free trailers. The first batch has only Mario Kart, but the second batch looks great. Better late than never I guess. Is there a cut off time for the trailers? I think I read somewhere that they would be removing the 3D trailers from the NA store pretty soon. @TheSolarKnight The date I've heard thrown about for the North American trailers, and the first batch of European trailers, is July 20th. I assume they'll stay on your system if you've downloaded them but that they won't be available to download from eShop following that date. Great, what has been available since launch in Japan and the USA, finally arrives in Europe, in two installments. Should we really be that grateful for unreasonable delays and finally doing something? It's welcome additions, but I don't get why we didn't get them around E3. It would've been better if these were available near e3 but at least we're getting them. Also, when are the eshop cards going to be available in Europe?!? Finally, what took them so long? Finally! I was beginning to think we wouldn't get them at all. AWESOME!!!! Can't wait to DL and see them! So, we just need to contact Nintendo of Europe to get the stuff we want? Cool. Too bad this wont work with NoA apparently, gnihihihi. Well, except.. MGS3.. It's not really impressive. @komicturtle92 Actually I enjoyed all the trailers except for the one for Ocarina of Time, which is the worst game trailer I've seen in recent memory. The MGS one was kind of interesting because it kept going in and out of 3D to mess with you. I love The Legend of Zelda: Shockarina of Time. lol at accidental smileys. I hope the trailers will be available in Australia too. My 3DS is nearly here! @marioman123 Then you should already have access to them. I guess my Yay! post got deleted. Didn't have more to say at that time but yeah, these are good news Waiting for these to come, just noticed that there's a PES 3D trailer that I hadn't seen yet. I think NoE have had enough of the complaining because not only has this been announced they have also announced 3DS TV to released mid-July... now all we need are the eShop cards and mabey a messaging system then all is forgiven. ^ Got a source for that? hmmm, read the article on electricpig again and it isnt confirmed, just implied. I got my hopes up when it mentioned July 19th as the launch date for 3DS TV. Downloading Mario Kart now as we speak! The Mario Kart really does look good as a 3D trailer, the video on the Nintendo channel wasnt able to capture how nice it looks on the small screen. This is why Nintendo needed to offer these trailers, watching videos on something other than the system you are playing just cant do them justice. Star Fox looks very good too. Wasnt too bothered about getting it because I have Lylat Wars on the Virtual Console but after seeing the 3D trailer I may change my mind. @38: Totally agree. Thats why we need those trailers. MK 2D footage looked straight ugly, but after watching the 3D trailer I can actually accept this game. congratulations i'm sure you'll enjoy the trailers, i know i do!